We are an active adult nudist resort affiliated with AANR located under the warm South Texas sun! 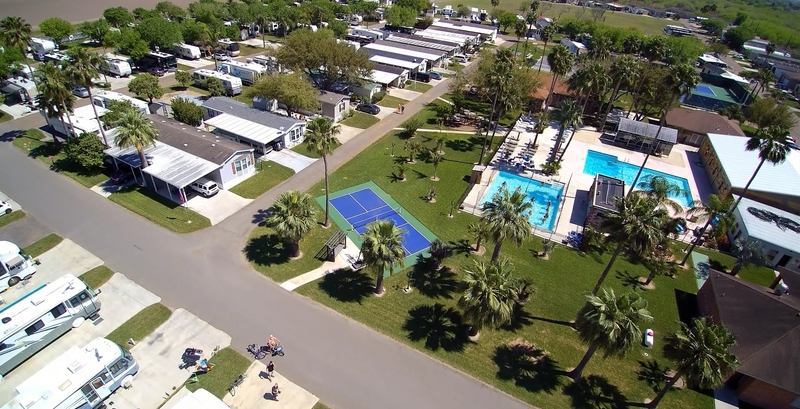 Whether you select to rent one of our beautiful deluxe suites, lease a scenic site for your RV, or purchase one of the select manufactured homes in our resort, you are sure to experience what it means to live in an energetic, welcoming community. From the moment you enter the gate, you are greeted with towering palm trees, manicured grounds, expansive pools, modern buildings, new pickle ball and tennis courts, and most importantly our friendly office staff who are there to make your stay a wonderful and fulfilling experience. Our grounds provide a lush and tranquil backdrop to the wide variety of entertaining events and activities enjoyed daily by both our long term residents and winter visitors. As our guest you have the option of participating in as many happenings as you wish; everyone is always welcome. Also, if you are craving a more quiet form of relaxation, there is always a comfy deck chair by our sparkling pool where you can curl up with a great book or simply bask in the sun. What sets Sandpipers apart from other resorts is our unique Texas hospitality. Every visitor who shares a piece of their winter with us, whether just for a brief time or the entire season, leaves with invaluable friendships and warm memories! So come and stay with us and make this a winter you will never forget! Here’s a taste of what Sandpipers has to offer.